MASCOT® FOOTWEAR CASUAL is the perfect combination between work shoes and every day shoes. With the CASUAL collection you get classic sneakers without safety components, which in terms of quality, design and the comfortable fit match the safety footwear you already know from MASCOT. 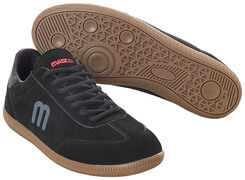 MASCOT® FOOTWEAR CASUAL is different from the rest of MASCOT’s selection of footwear, as the collection does not have toe cap, nail protection and other safety components. On the other hand, the footwear offers you an exceedingly high walking comfort. With the CASUAL collection, we have created a good alternative, when you are looking for footwear without safety. Due to numerous requests from customers, MASCOT has launched sneakers, where the main idea was to create comfortable footwear in innovative and new materials. The collection, among others, use upper materials in suede and an outer sole in rubber. Additionally, the footwear has a low weight under 300 grams. Footwear in the CASUAL collection has a classic design inspired by previous decades’ sport shoes. By combining the classic style with the latest innovation possibilities and the development of the fit, you get a smart and functional footwear collection that matches both profile clothing and classic workwear. MASCOT® FOOTWEAR CASUAL is the obvious choice to all professions, where ordinary sneakers can be used. If you wish to give all your employees a streamlined identity across job functions, the CASUAL collection is ideal for the employees that do not need safety footwear. MASCOT® FOOTWEAR CASUAL is in short; an all-round collection of footwear that fulfils your demands to comfort, flexibility and functionality.